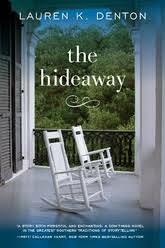 The Hideaway by Lauren Denton tells the story of how one house changes the lives of two women. Maggie was a Mobile socialite with a cheating husband. She found refuge at the Hideaway Inn and eventually an entirely different life. Sara is Maggie’s granddaughter who has a successful business in New Orleans, but she is pulled back to the Hideaway. Once there, she realizes the home and the woman she never fully appreciated. This story has a full cast of characters from greedy developers, to eccentric senior citizens, to a swoony craftsman. I enjoyed the relationships and the history of the house visiting the present day. It is a story of sacrifice, love, and tradition.